Hello dear readers! Hope you’re having a great Wednesday! My post today is one of my fave’s so far! 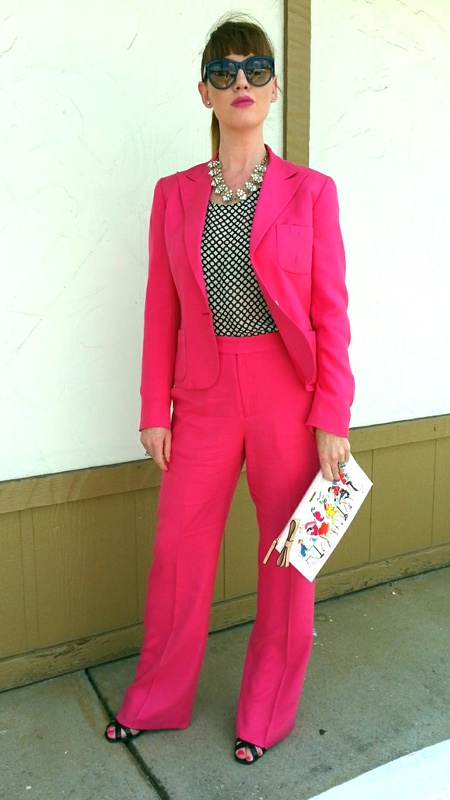 I have been searching for a pink pants suit for months….and I do mean months. You’d think this is something that one could easily find?! But, that evidently isn’t the case. After multiple internet searches, I must admit Google let me down. I could find nothing that resembled what I was seeking. 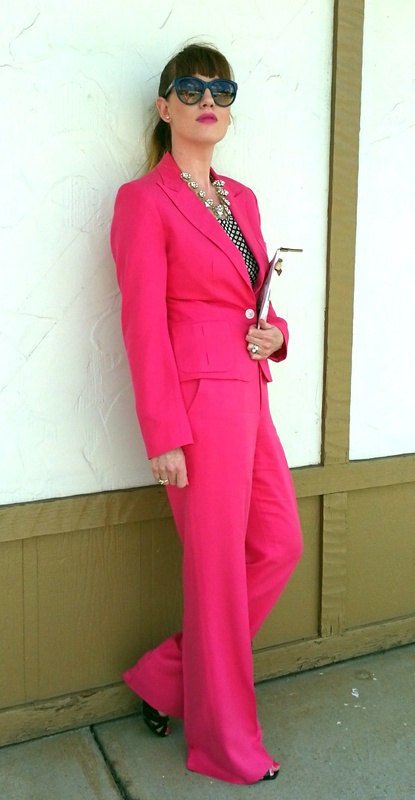 I decided to turn to my trusted and beloved friend, eBAY and after a few weeks of watching, waiting and running the same key word search “women’s pink pant suit”, I stumbled upon the wonderful suit I have on today. The suit is silk, fully lined and by Ralph Lauren. And the BEST part….it was only $19.95!!! What a steal! I couldn’t wait to debut it today on the blog…and I am aware that it needs hemming and a few other tweeks but I was too excited to delay. I have plans for it too. BIG plans…involving a lace or feather, poofy brooch, which I hope to be making shortly…trust me…it’ll be fabulous. I’d really like to pair it with a lovely pale green shirt or perhaps a pale, light pink one too. Keep an eye out for future posts! I’m so excited that I found what I was looking for and at such a great price! Tip: if you’re ever looking to recreate a look you like or searching for a specific item, always check your options on eBAY. I find that key word searches will typically result in a variety of choices. Keep your key word searches simple, typically “Brand+Color+Clothing Item+Size+Woman” is as specific as you should go. 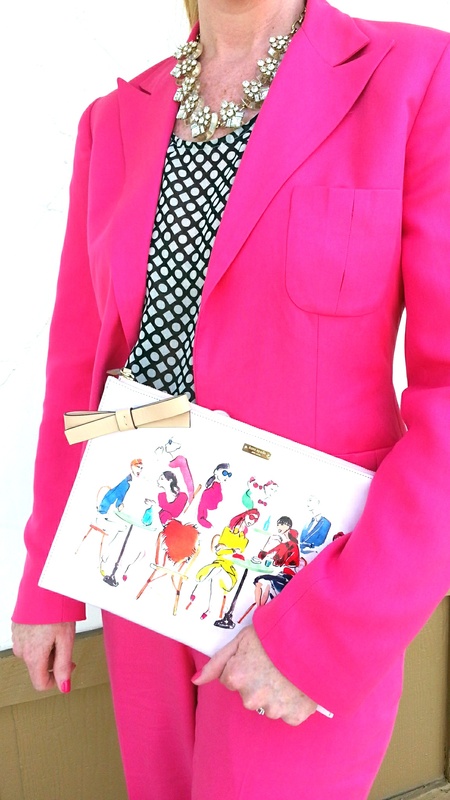 For this search I used, “Pink Pant Suit Woman Size X” (I inserted my size but I’m not sharing!). Always remember to check the eBAY seller’s feedback before purchasing to ensure there are no negative remarks. Whew! What a week…I’ve been so busy with work and life that I’ve not had time to post. Due to my hectic schedule this has been a week of wardrobe repeats…but I must say that having this blog makes it so easy to put something together! I can basically just copy one of my looks from a previous post and no brain power gets wasted on figuring out what to wear. Unfortunatley, I’m still wrapping up work related items but I do have just a couple of snapshots for today that I took quickly in between appointments. This look hasn’t been featured before and it is simple but visually interesting. 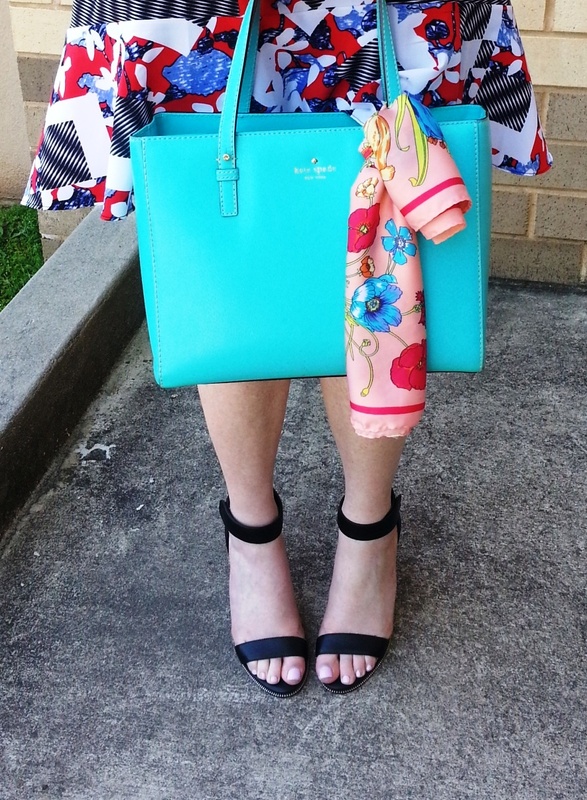 I love mixing floral prints with stripes and other patterns. 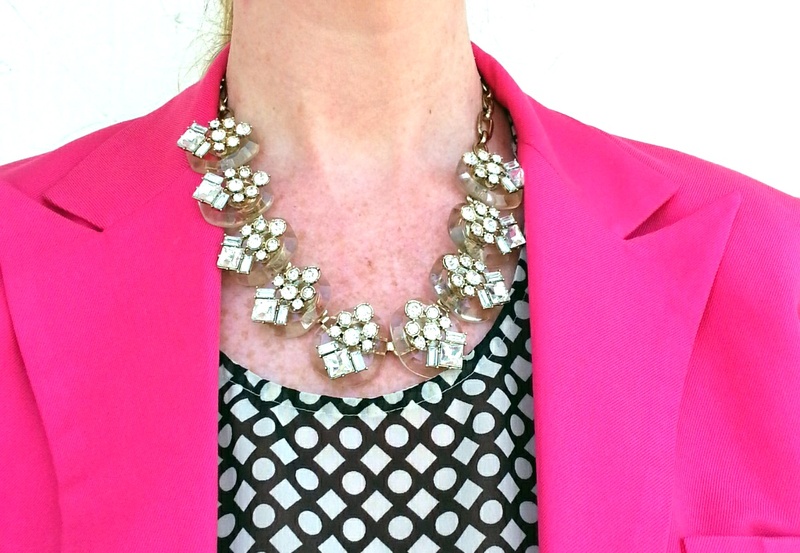 Add some pearls and you’re ready to roll! 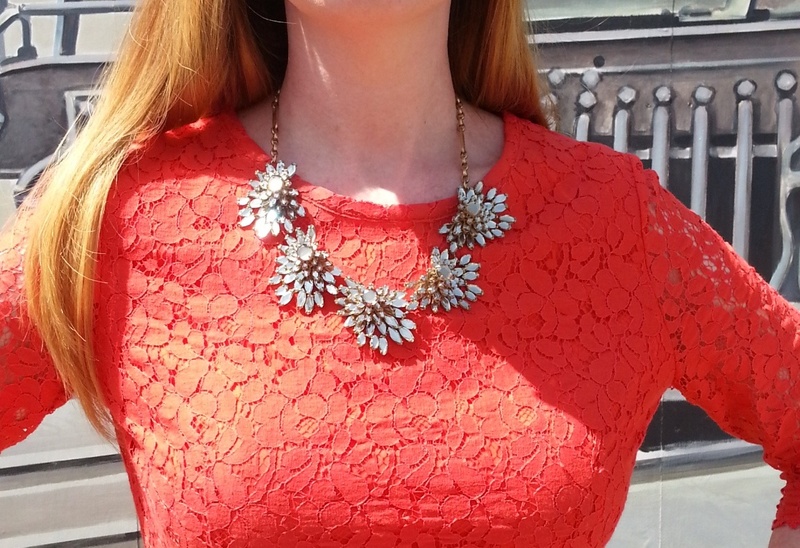 Wearing an Orange Poppy Print…today on Cortneybre! 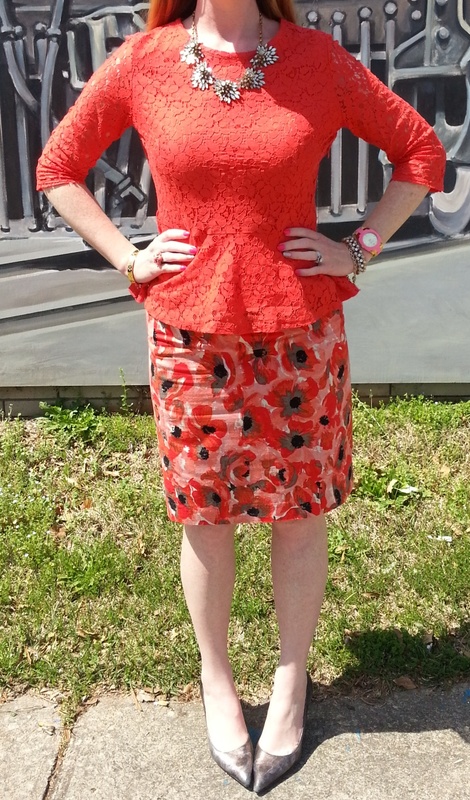 I needed a pick-me-up today and decided to “go bright”! 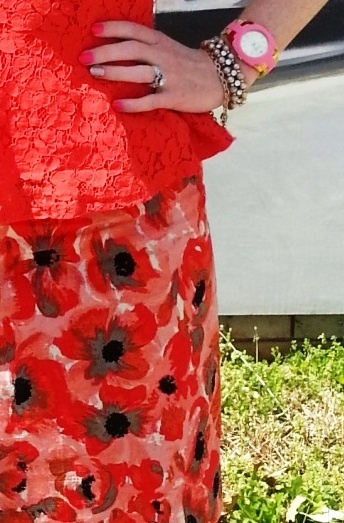 I knew I had this beautiful poppy print orange skirt (find similar here) but didn’t realize I had a peplum blouse (find similar here) that matched it so perfectly. While holding the skirt up to various blouses and tops hanging in my closet I realized I had the perfect match hanging in front of me when I spotted this top! I actually even own a pair of sandals that also match perfectly, but I fought the urge to match everything head to toe (a weakness of mine). Instead I wore a pair of Cole Haan Pumps with awesome NIKE AIR technology. They are the most comfortable heels I own! 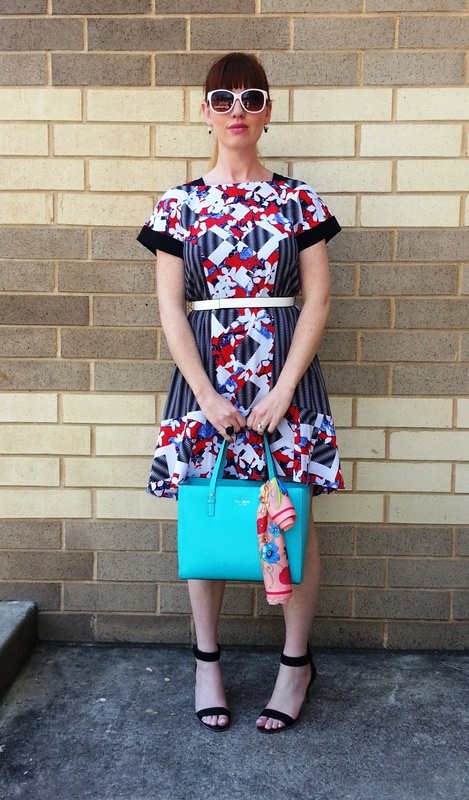 A Peter Pilotto dress…on Cortneybre! 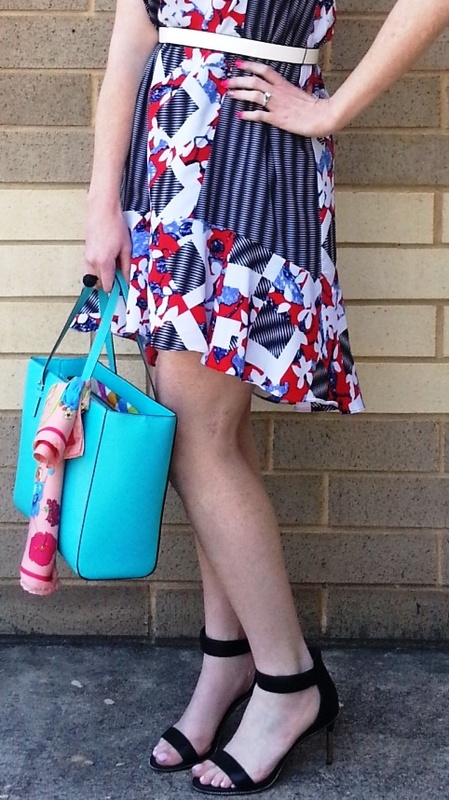 It’s finally warm enough to pull out my Peter Pilotto for Target dress that I purchased a few months ago. I’ve been dying to wear it but it’s a very light dress and I wanted to ensure it was the proper time to wear it and not pull it out too early. It’s a great dress, the fit is nice and the cut is fabulous. The dress is longer in back than in front and has a wonderful airy feel. This is gonna sound crazy but its like having butterflies follow you around and dance at your heels when you walk. Seriously. Don’t believe me? Try the dress and see for yourself! I wanted to see what others thought so I checked the reviews on Target.com and they vary. I find that the dress fits true to size – but if you’re petite or tall it loses proportion and will be ill-fitting. Many people didn’t like the belt but it fit me perfectly and I actually thought it coordinated well with the print – although I’m not generally a fan of white belts or shoes. Overall, I really like the dress and I’m happy with my designer purchase (at not so designer prices)! Also, the Peter Pilotto collection is now on sale at Target! 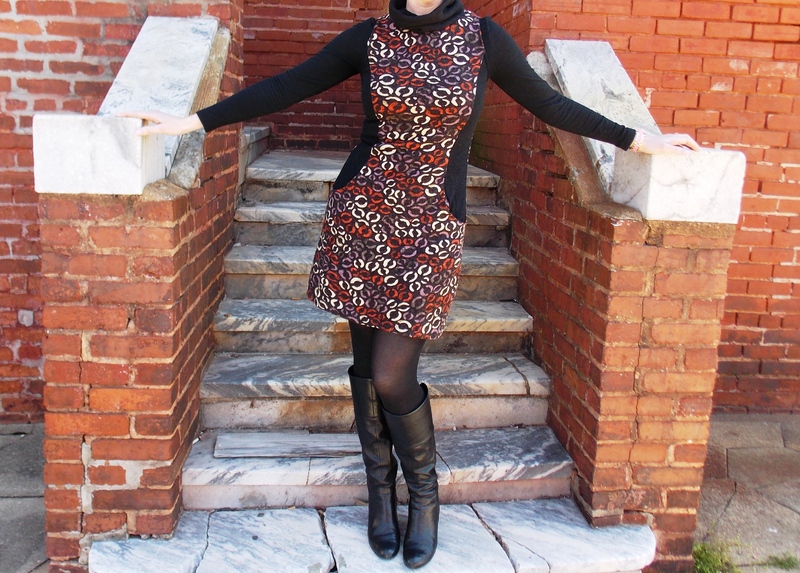 Click here to shop for this dress! 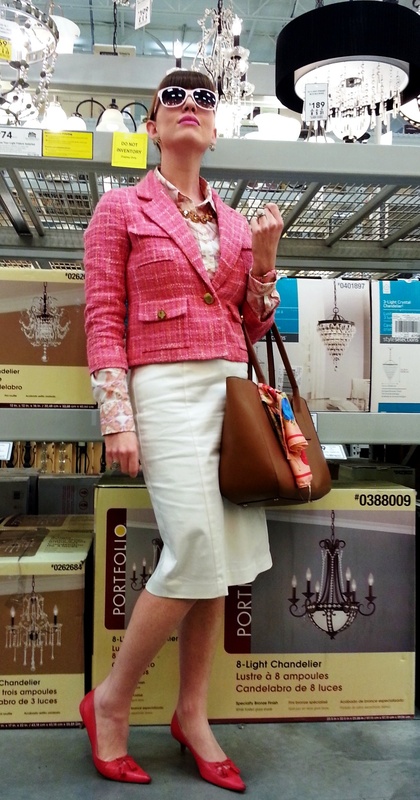 Kate Spade Fashion …at Lowes?? You’ll find beauty in the most unlikely places. 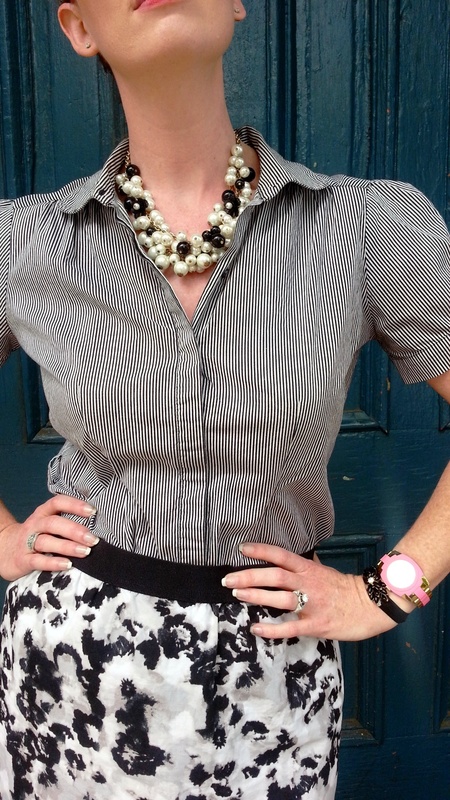 I had to run a few errands today and planned on shooting today’s outfit outside in the bright, Spring sunshine. I then walked outside and into a rainy, gloomy and dismal day. There went the photo shoot plans…not to mention my hair! While running errands with my friend, I found myself at Lowes, where America “Never Stops Improving”. Not sure if everyone has access to a Lowes but it’s a very large, “big box” home improvement store. Think lots of lumber, plumbing tools, saws, wrenches and general stuff that falls into those categories. My only reason for being at Lowes was to buy a last minute birthday present for my hubby – Happy Birthday today Hubby! As I walked thru the aisles of Lowes, I tried to find some beauty in the items that they stock. I thought that if I could only find some nice spot, some oasis of delight, I’d whip out my camera and shoot a few pictures right in the store! After searching a bit I stumbled into the lighting area and found a wonderful display of chandeliers, tinkling and sparkling in soft lighting. It was perfect! Or as perfect as its gonna get when you’re pulling off a “OOTD” shoot in a home improvement store! So here’s my pics – hope you enjoy! Hello friends! 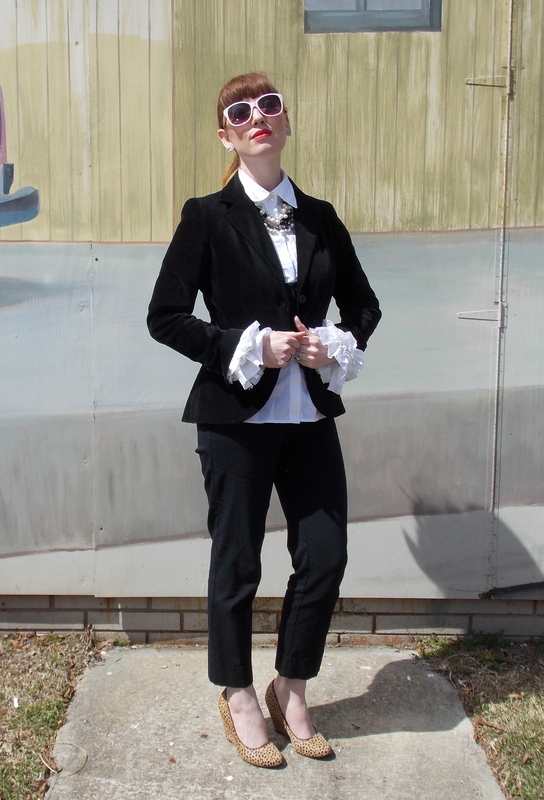 Just a short snippet today….I’m sporting my version of the work approved tuxedo! 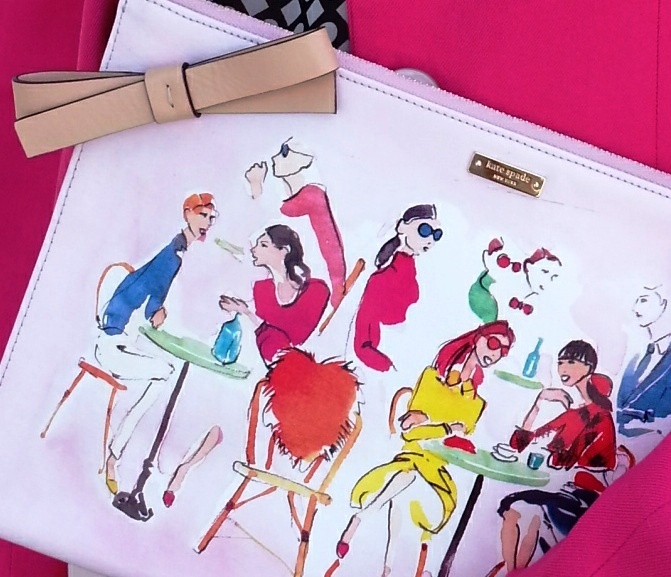 Dressing up doesn’t always mean donning a gown or bright colors. 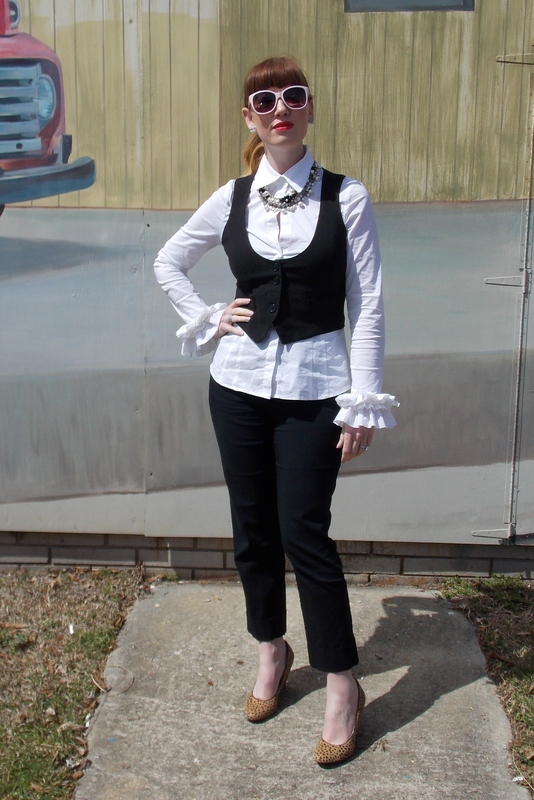 I must admit I feel very polished and chic when I wear black and white – like I’m in a tux (sans the bow tie, which I actually considered!). 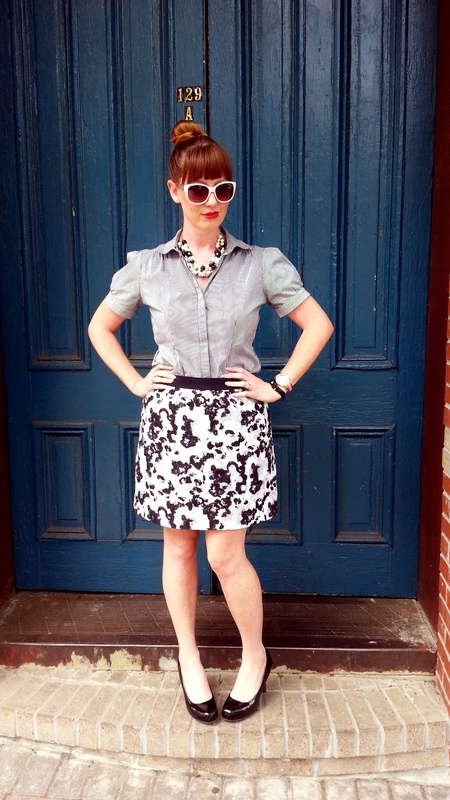 Animal print shoes or accents keep it snazzy! Nothing like keeping it simple but elegant…especially on a busy Monday!